Stephen Bush has always been troubled by history, both the history of painting and history ‘at large’. He has depicted himself in the guise of historical characters such as Napoleon, Bungaree and the explorers Burke and Wills, and painted redundant technology once associated with progress, such as old tractors and obsolete computers. The backgrounds to many of his paintings are old-fashioned, lushly romantic landscapes of fields, mountains, woods and billowing clouds. The landscapes are tempered by the suggestion of irony in his choice of foreground subject, such as a large mechanical ‘crawler’, used for land clearing, painted from a low angle to give it a monumental presence in front of the dramatic forested mountain backdrop it seems set to destroy. In many of Bush’s paintings he has manipulated colour to work against the realism of his imagery, such as the ‘Venetian red’ series in which he painted rural scenes entirely in a rich monochrome red. The heroism of Bush’s history painting is a mock heroism but at times only just. Bush seems genuinely fascinated by the achievements of the past and yet he cannot quite take them seriously as a subject for art while still being drawn to emulate the traits of 19th-century history and landscape painting. In ‘The lure of Paris’ series begun in 1994, Bush painted a theatrical tumultuous seascape with light breaking through clouds in the distant horizon. In the foreground three Barbar-like toy elephants climb down a rock face. The painting seems a satire on artistic endeavour and the desire from this distance to live and work in a world cultural centre, but if it wasn’t for the stuffed elephants it would be easy to take the heroism implicit in this painting seriously. The tension between scepticism and belief in Bush’s art is always balanced with humour and an examination of the role of the artist. In this instance he also took authorial originality to task, painting many copies of ‘The lure of Paris’, each one from memory rather than directly copying the previous work. More recently Bush has combined abstract areas of paint poured onto the canvas with realist imagery but in high-keyed pop colours, such as the lolly pink and bright green in Ericifolia. The poured paint seems to have formed a sublime landscape behind the building, and yet it is just poured paint with no distinctive landscape features and is dependent for recognition on an imaginative projection on the part of the viewer. The hut is marked with the passage of time as its exterior coat has peeled away to reveal the structure beneath. In front are what could be gold mining pans, a bundle tied to a rope, and an oddly biomorphic felled tree branch, evidence of past endeavours. 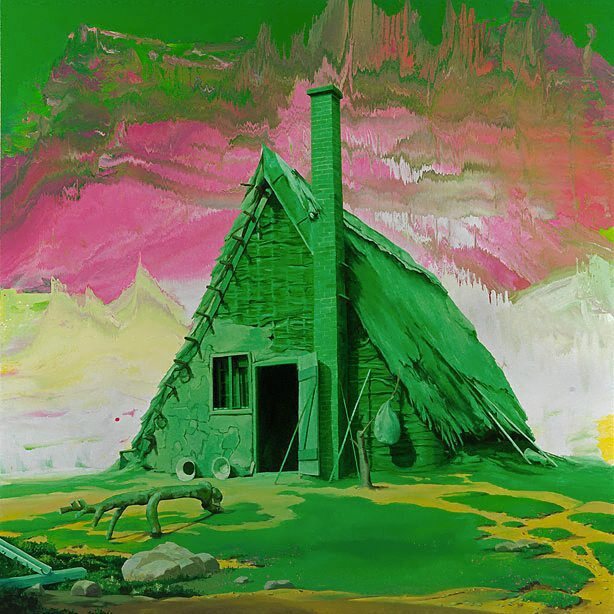 While appearing realist in form, the hut itself is also painted in the same unnatural green as the foreground and merges with the surrounding landscape. Bush’s visual language is inventive and increasingly pop-oriented while continuing to refer to traditional genres such as alpine landscape painting. George Alexander, Contemporary: Art Gallery of New South Wales Contemporary Collection , 'Popism and screen culture', pg.204-245, Sydney, 2006, 214, 215 (colour illus.). Laura Pia, Look , 'Stephen Bush: Still what he meant to be', pg.12-14, Sydney, Dec 2009-Jan 2010, 12 (colour illus. ), 14.